Spice up your cardio with the EVO ix indoor cycle. Offer your members a fun, exhilarating cardio and core training workout in one sleek, stylish product with the unique RAMP" frame that sways with body movement. Let them measure their results with the EVO computer that comes standard with each bike. And, guarantee that they get a safe, comfortable workout each time with the InfiniteFit" handlebars and hybrid saddle. 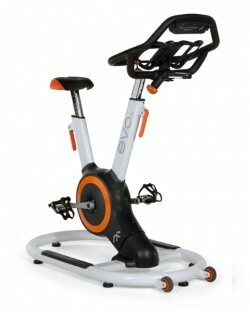 EVO ix raises the bar on indoor cycles and your cardio deck!